There are two types of fire rated glazing types: Fire Protective Glass and Fire Resistive glass. Both block smoke and flames. But only Fire Resistive Glass can block the transmission of dangerous radiant heat. Both Fire Protective and Fire Resistive glazing have their own set of performance features, test standards and allowed applications under the building and fire codes. Simply relying on the fire endurance rating (20, 45, 60, 90, 120 and 180 minutes) or whether a product is thick or thin can lead to faulty specifications and misapplication of the FRG. Check out the Safe Glass for Schools Glossary. Fire protective glass is designed to block smoke and flames, but it cannot block radiant heat. Fire protective products are subject to the following test standards: NFPA 252, NFPA 257, UL 9, UL 10B, UL 10C. Fire protective glazing products include: specialty tempered, traditional wired glass, safety wired glass, and ceramics. 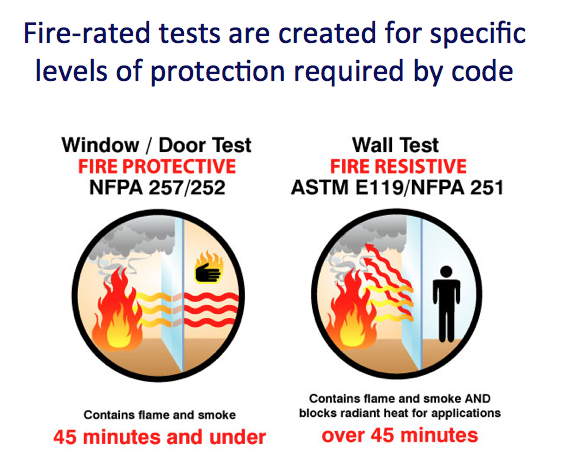 While some fire protective products are rated 60 to 180 minutes, they have limits on their use in 1-hour walls and vision panels in doors. They are prohibited altogether in sidelights, transoms, and windows in 2-hour interior walls. Fire resistive glass blocks smoke, flames and radiant heat transmission. Fire resistive products are tested to the following standards: ASTM E-119, NFPA 251, UL 263. These standards apply to all fire-resistive wall materials where the temperature rise on the non-fire side cannot exceed an average of 250º F. Fire resistive glass products include fire retardant filled units and multi-laminates. Because FRG is used in door and wall assemblies, it is important to also consider code requirements for framing. Simply put, the fire-rated framing requirements must match the glazing requirements. Depending on the composition and design of the fire rated glass, it can be either fire protective or fire resistive. 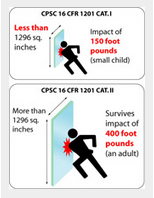 Fire protective glass blocks smoke and flames, but not deadly radiant heat. Fire resistive glass blocks smoke, flames and radiant heat. Click here or the image (right) to see a video detailing the difference between fire protective and fire resistive glass. In 1977, traditional wired glass was given an exemption from meeting the Consumer Protection Safety Commission’s (CPSC’s) impact safety standard when used in doors, sidelites and other potentially hazardous locations because glass manufacturers claimed that they did not have the technology to make fire-rated glass that could meet the glass safety standards. In the last decade, advances in fire-rated glazing technology led to safer, wire-free alternatives that provide both fire and impact safety. Today, IBC model codes stipulate that all fire-rated glazing must comply with the same impact safety requirements that apply to any other type of architectural glazing. Prior to the 2003 and 2006 IBC, model codes exempted traditional wired glass from having to meet the same impact safety requirements as any other glazing. Loss of that exemption was a big step forward to minimizing serious injuries. The 2003 IBC removed the exemption for wired glass in educational occupancies, and the 2006 IBC removed the exemption for all occupancies, so that wired glass is now required to meet the CPSC safety glazing requirements, just like any other glazing product. In addition, the IBC 2003 and 2006 IBC prescribe a higher requirement for glazing used in gymnasiums and similar types of athletic facilities, requiring glazing used in “areas subject to human impact load” to meet the Category II CPSC impact standard. 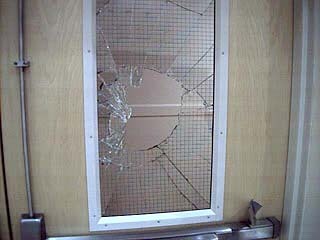 Traditional wired glass is NOT safety glass. The wire actually weakens the glass and increases the likelihood of breakage even under the relatively mild force exerted by an elementary school student. Even worse, a student’s hand or leg that passes through the easily broken wired glass panel can be snared by the wire making resulting injuries more severe. Since 2003, the International Code Council’s model building codes have required that all glazing in potentially hazardous locations in new educational facilities must comply with Federal Consumer Products Safety Commission (CPSC) impact-safety standards. In 2004, traditional wired glass was banned in all building types. Click here to learn about what constitutes a hazardous location.